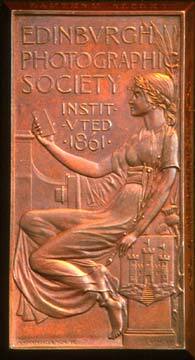 In recent years, until 1907, Members had participated in the EPS Open Exhibition, having their own section. However in 1908 it was decided to hold a separate exhibition for Members' work. "an undue share of encouragement had been given to the pictorial and artistic photographer to the detriment of the more ordinary worker who strove more after technical than artistic excellence"
"a truly excellent display of work, far surpassing anything that that was expected in regard to numbers, technical excellence and high artistic merit." - 'Photography and Focus' - exhibition, kindly lent by the journal. The medal below is the same style as those awarded in the 1908 Members' Exhibition but, in fact, was awarded in the Lantern Slide Section of the Members' Exhibition eight years later. - membership of EPS was not confined to the city, its special rates for country members assisting greatly in its high membership roll. - a number of awards have been gained by non-resident members. The British Journal of Photography reported that the exhibition showed a good level of quality and that it should be a popular item in Edinburgh photographic life. "The President has shown his active interest in the survey section of the society - a branch of work that we have frequently commended - by gaining the medal in that class, besides one in architecture, thus showing that he is not merely a figure-head but an active working president. The 1909 EPS Exhibition was held in the EPS Premises at 38 Castle Street. There were 143 prints. The judges were A Eddington, RS Webster and JCH Balmain. This was a particularly successful exhibition for AG Watson who was described as a Western Member.